Freddy Manny was born down the docks and tells of his many adventures around the area. 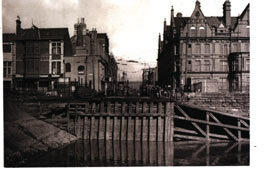 Another time we were down the Pierhead, now Mermaid Quay, near where the pleasure boats used to come in. They would take you to Penarth, Bristol, Ilfracombe or Western. They were the big paddle steamers. When we were kids we used to jump off the Pierhead and take one of the little rowing boats and row up and down, it must have been one of the most dangerous things we ever done in amongst all the big boats. Looking back I remember the wash of the ship was higher than the boat itself.